Truckers will have one more reason to hate driving to or through New York City. Part of the $175 billion 2020 budget passed by the New York state legislature last weekend is the nation’s first congestion pricing plan. The plan will charge drivers a premium for driving in the city’s central business district below 60th Street in Manhattan. The congestion fee is expected to raise some $15 billion. While details are still being refined, it’s expected in 2021, drivers of cars will pay between $12 and $14. Last year a panel studying the issue suggested truckers would pay a flat $25 per day, but the budget includes wording that suggests the fee will vary based on the most congested times of the day. There is no word if other tolls will be included in the fee charged to truckers. Taxis will be billed $2.50 per ride, while ride-hailing services like Uber and Lyft will be billed $2.75 for each trip. The plan is the first in the U.S. and is similar to one that has been in place for years in London. It’s meant to reduce traffic in the busiest section of Manhattan, and raise money to repair the city’s subway system and for other mass transit organizations. Last year there was mention of a similar plan for Seattle, and Los Angeles, San Francisco and Portland, Oregon are studying the possibility of such fees. Opponents of the New York City plan claim it will simply cause traffic problems elsewhere in the city. The Commercial Vehicle Safety Alliance (CVSA) has released the latest updates to its out-of-service criteria that governs when drivers and vehicles should be pulled from the road. The changes to the North American Standard Out-of-Service Criteria cover everything from brakes to cargo securement devices and seats. Updated guidelines for braking systems, for example, have been updated to include pictures of cracked brake rotor structural supports. If such cracks extend through rotor vents, the rotor is about to collapse, CVSA says. Non-manufactured holes in a steering mechanism’s drag link are now clearly forbidden as well. Bearing straps were also added to the potential out-of-service conditions for universal joints, while new rules for the driver’s seat have been introduced to ban temporary seats that take the place of permanent seats secured in a workmanlike manner. But passenger-carrying vehicles with manufacturer-related violations in temporary seats and aisle seats can still receive a CVSA decal. Details about the Doleco USA Textile Link Tiedown Assembly better illustrate whether it should be found defective. And drivers who hold a valid Skill Performance Evaluation (SPE), but don’t comply with the related requirements, will find themselves out of service as well. Meanwhile, frame-related rules were updated to identify those that should not pertain to monocoque-style frames. Some of the latest changes to the document have been designed specifically to make the information easier to navigate. Subheads have been introduced to the text that pertains to exhaust systems and cargo securement devices. The changes will be incorporated into training materials and bulletins by the CVSA training committee, Canada’s education quality assurance team, and the American national training center. The North American Standard Out-of-Service Criteria is updated every year. Each week throughout the golf season, trucks from all the major equipment manufacturers travel from tournament to tournament as part of the PGA TOUR’s nationwide caravan. This week, TaylorMade’s truck is drawing extra attention in Austin, Texas, site of the World Golf Championships Match Play event. Forget over-sized driver heads, TaylorMade has unveiled the biggest Tour truck of its kind – a $1.6 million, multi-level behemoth that weighs 22 tons. The new 42-foot long TaylorMade truck was inspired by those on the Formula 1 auto racing circuit and designed from the wheels up. With more capacity, workspace and advanced technology than any other vehicle of its kind on tour, it will replace a trailer that attended more than 350 PGA TOUR events over the past decade, traveling an estimated 400,000 miles. TaylorMade has unveiled the biggest Tour truck of its kind – a $1.6 million, multi-level behemoth that weighs 22 tons. When parked, the truck has dual slide out pods on each side as well as a second level that pops up to provide space for meetings or for TaylorMade’s tour players to gather. “It’s a place they can not only come to have their equipment built, but a place they can come hang out and truly feel like part of the TaylorMade family,” said Keith Sbarbaro, TaylorMade’s Vice President of Tour Operations. The first level has all the usual necessities, with a modernized workshop that includes multiple lie and loft machines, shaft cutters, a dedicated gripping station and a variety of other club-building tools. The truck is equipped with more than 1,500 shafts, 1,200 TaylorMade TP5 and TP5x golf balls, 1,000 grips, over 700 clubheads, and 500 hats and t-shirts. Additionally, it features 12 individual player lockers, a gathering area with couches, four high-definition televisions, a video game system, a built-in coffee machine and a two-zone sound system. TaylorMade estimates that its previous tour truck built more than 75,000 clubs over the past 10 years at PGA TOUR stops across the country. The new truck, while unveiled at the Match Play event in Austin, will make its official debut at The Masters Tournament next month in Augusta, Georgia. In total, it’s expected to travel around 35,000 miles in its first full year on tour. The owner of Lipsey Logistics and Lipsey Trucking has relinquished control of the business after being arrested on drug charges at his home in Colorado. Joseph Lipsey III, along with his wife, Shira, and son, Joseph Lipsey IV, were charged by police in Aspen, Colo., on March 12 with distributing cocaine, possession of drug paraphernalia and providing nicotine to minors. All were released on bond and are scheduled to make a court appearance April 1. The company, in a statement released March 18, announced that Johnny Jones will immediately take over as CEO of Lipsey Trucking while also serving as president and CEO of Lipsey Logistics. Lipsey will no longer have any ownership or control of the business, according to the statement. Jones and Lipsey have worked together since 2010 with Lipsey Logistics developing a business hauling water, ice and other supplies under contract with the Federal Emergency Management Agency. Lipsey Trucking, based in Chattanooga, Tenn., started in 2017 and operates a fleet of 82 tractors and 425 trailers, according to registration data on file with the U.S. Department of Transportation. The two companies employ about 200 people and generate combined annual revenue of more than $300 million. In the company’s statement, Lipsey is described as “principally an investor” in the company with limited involvement in day-to-day operations. “Regardless, we would like to assure the public that his exit from the business is immediate and permanent, and that he will have no ownership of or control over the companies going forward,” according to the statement. Lipsey transferred all of his voting shares in the company to Jones and did not receive any compensation for relinquishing his ownership in the business, the spokesman said. “While the allegations relate to personal matters and have nothing to do with our business, the company takes them seriously and does not wish for them to distract from our operations,” the company said in its statement. The company also said that John White, who joined the Lipsey organization in February as the head of a new flatbed business called Lipsey Transport, will be asked to take on the added role of president of Lipsey Logistics in October. The delay is due to contractual obligations from his prior employment. White worked for more than a decade at U.S. Xpress Inc. in Chattanooga, and served as chief marketing officer from 2013 to 2018. 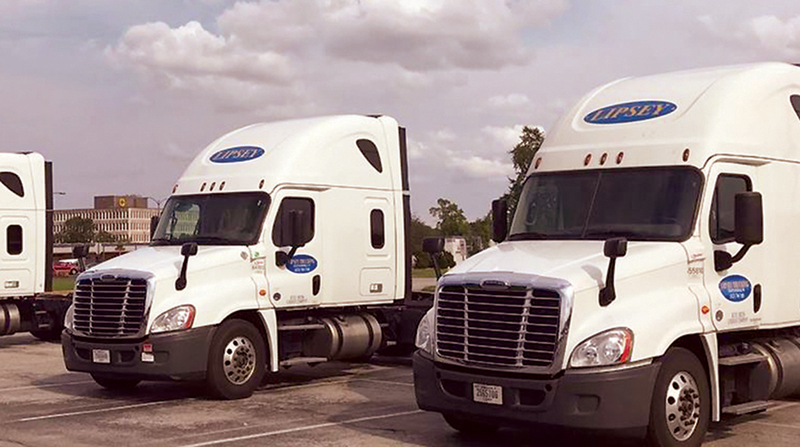 Prior to joining U.S. Xpress, White served in sales and marketing positions at Swift Transportation, MS Carriers and J.B. Hunt Transport Services. California Highway Patrol officers followed a trail of a bit more than stems and seeds to find the truck driver who had parts of his load of legal marijuana trimmings falling off his truck as he drove Thursday. It appears the gate on the back of the truck was not properly secured. The trucker was ticketed for not having a CDL once he was located and stopped in Emeryville. The average price for a gallon of diesel nationwide rose exactly one penny for the week ending March 25, to stand at $3.08 per gallon, according to the U.S. Energy Information Administration (EIA). With the weekly increase, diesel costs 7 cents more than it did a year ago and 11½ cents above a recent low-water mark in late January, where the price hovered at $2.965 for two weeks and then at $2.966 for two more before beginning the current slow climb. Diesel prices rose in every EIA region in the country with the exception of the Central Atlantic region of the East Coast, which saw a tiny $0.003 drop in diesel, to finish at $3.310, which is still the highest price to be found anywhere outside California and is 9.3 cents above what it was in the Central Atlantic a year ago. North and south of the Central Atlantic, the New England and Lower Atlantic regions both recorded price increases of $0.014, giving the aggregate East Coast an increase of $0.008, to stand at $3.132. In New England, the price of diesel stands at $3.214, while in the Lower Atlantic, it is $2.995, one of four regions where diesel is still under $3 per gallon. With a minimal $0.001 increase, the Midwest stayed just below the $3 threshold, at $2.993, while the Gulf Coast, as usual, enjoys the lowest diesel prices in the nation, at $2.876, up $0.007 from a week earlier. Diesel also remains under $3 in the Rocky Mountain region, at $2.974, after a 3-cent gain, the second-largest increase, after California’s $0.038 price hike. The Rocky Mountain region is currently the only region in the country where diesel costs less than it did a year ago. The overall price of diesel rose on the West Coast to $3.526, an increase of $0.029. California has both the highest diesel prices, $3.819, and the highest year-to-year increase, an even 15 cents. Crude oil prices were split on Monday, Brent crude, the international benchmark for oil, rose by 18 cents, to $67.21 a barrel, while U.S. crude ended Monday’s session down 22 cents, at $58.22. Early Tuesday, Brent was up 92 cents, and U.S. crude had added $1.28. Truckers visiting the Petro Stopping Center in Beaumont, Texas (Exit 848 at I-10) now have more dining options thanks to the recent addition of a Black Bear Diner. Black Bear Diner offers homestyle meals such as chicken fried steak, corned beef hash, slow-cooked pot roast, apple cobbler, and more. The restaurant can seat 126 guests and is open daily from 6 a.m. to 10 p.m.
“We are excited to be adding another Black Bear Diner to our collection of brand offerings. From the unique and fun décor featuring carvings and murals of bears to the hearty delicious menu items, we believe Black Bear Diners offer our customers something different on the road. And, anytime we can bring a new full-service restaurant to one of our locations we do, so we can offer traveling motorists and the local community the opportunity to sit down, relax and enjoy their meal,” said John Ponczoch, senior vice president of TravelCenters of America and leader of the TA Restaurant Group. Area truckers are aiming to protest trucking industry regulations they believe to be unfair and overreaching with a planned “slow roll” protest Wednesday on highway systems throughout Missouri. Then on April 12, Black Smoke Matters, a Facebook group made up of thousands of truckers from around the country, is calling for a nationwide trucking strike to bring awareness to what it says are the issues truck drivers face on a daily basis. An estimated 30,000 truck drivers will be participating in the strike by taking anywhere from a day to the following week off from their normal routes to call attention to what the group say are overwhelming regulations, roadway safety problems and a lack of adequate driver training. A Black Smoke Matters-Missouri branch has formed in support of the movement and dozens of area truckers are hosting their own statewide protest Wednesday, including in Joplin. Truckers will meet at 9 a.m. at Joplin 44 Petro and roll out at 10 a.m. where they’ll be traveling to and from Springfield on Interstate 44 at minimum highway speed, which is about 45 mph. Billy Bogar, of Lamar, is helping to coordinate the local effort. The truck owner-operator leases with a carrier, and has been driving on and off for the trucking industry for 20 years. Bogar said one of the biggest problems facing the trucking industry is the lack of proper driving training with megacarrier companies. He mentioned how the companies' driving schools have cheat lines on the asphalt to assist drivers with the test and that they’re being trained by unqualified instructors in only a few months before they’re placed on the road. The group is also speaking out against electronic logging devices, or ELDs, which are installed in every truck’s data port to record driver speeds and track hours of service and location. The Federal Motor Carrier Safety Administration began working on ELD mandates in 2015 and fleets had until December 2017 to implement the system. Truckers are allowed to drive for 11 hours in a 14-hour period. Bogar said this is a problem because drivers are now racing a GPS and an ELD to make their required time. Brian Adams, of Farmington, has served as an owner-operator, company driver and run a trucking company during his 20 years in the industry. He agrees with the concerns of BSM and is leading a slow roll from Cape Girardeau to St. Louis Wednesday at the same time as Joplin’s to raise awareness. Another issue he's fighting for is additional truck parking and rest areas. A pre-apprenticeship trucking program in Shreveport, Louisianan is recruiting young adults ages 21-24 for its class. 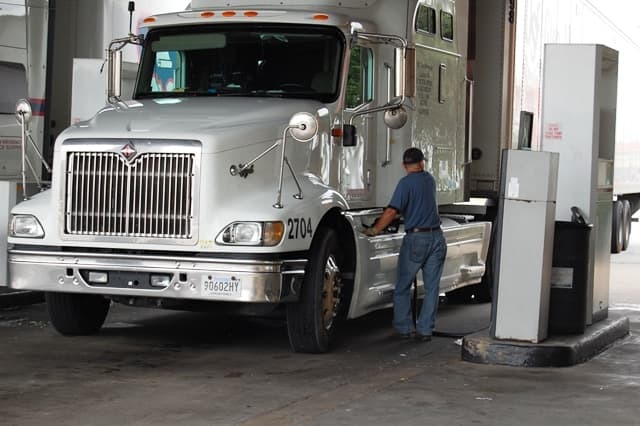 The Department of Community Development, Bureau of Workforce Development, and WIOA Youth Program created the program with Diesel Driving Academy to prepare young aspiring truckers for their driving careers. Participants will have the opportunity to get their CDL from Diesel Driving Academy before transitioning into a one-year apprenticeship at Schneider Trucking. The pay for the program is $9 an hour for 95 clock hours through Diesel Driving Academy. Training begins April 15. The program is available through the end of June. Participants must have a clean driving record, no felony record, and can pass a drug test and a DOT physical. Four tractor-trailers were destroyed in a fire Sunday morning at a truck stop in Indiana. The cause of the fire at the Flying J in Lake Station, Indiana southeast of Gary has yet to be determined. Firefighters responded at about 7:50 a.m. and found the four trucks — all unoccupied — fully engulfed in flames. No injuries were reported in the fire that was fought by three departments.